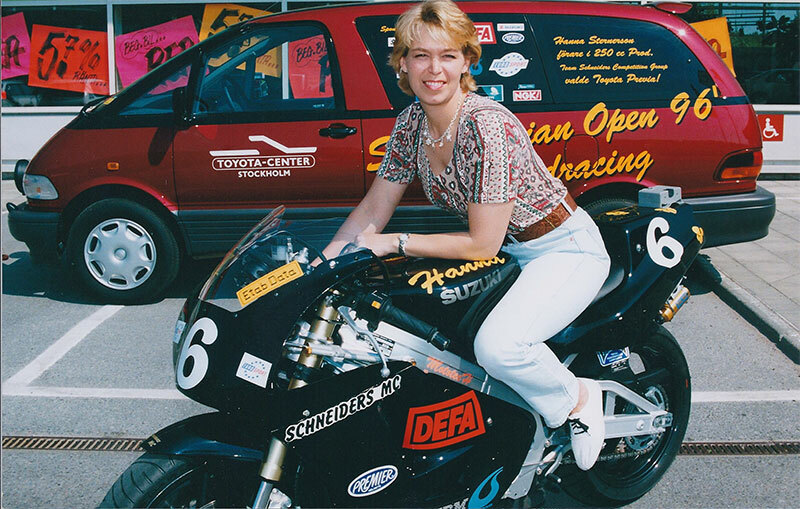 While my racing career was “hot,” I was lucky enough to attract some great sponsors. Nobody really cared about my racing results — which kind of upset me as I was pretty good! — they wanted to piggy-back on the exposure I got because the media loved the fact I was a female in a male dominated sport. The term “On Equal Terms at 150 mph” was frequently used in advertising featuring me and my bike. 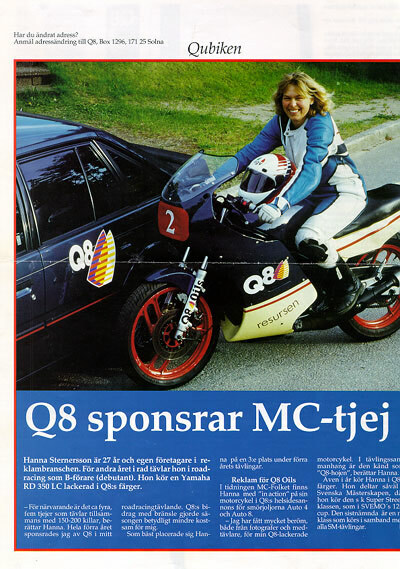 For five years, I was sponsored by Q8 (Kuwait Petroleum) which back then was one of the four major petroleum companies in Scandinavia. I had free gas for all my vehicles including my car year round for years! That was a huge deal in a place like Sweden where the gas runs about $18/gallon. Then Toyota of Sweden wanted a piece of the action as well and set me up with a customized Toyota Previa van. All lettered up and set up so I could transport my racing bikes inside it. Pretty sweet, if I may say so. And good on gas. I still have the Kamasa tool sets that I was sponsored with. My man has an issue with keeping them in their respective boxes in the garage, but last time I checked, most bits and sockets were still there. I can’t believe I managed to bring all that stuff with me when I left Sweden! I’m still bummed I couldn’t bring my compressor though (would have been a 110/220 volt issue).